Behind on posting the outcomes again, imagine that! 😉 I’m honestly just impressed that I’ve managed to make it this far trying a new recipe each week, and documenting the steps along the way. 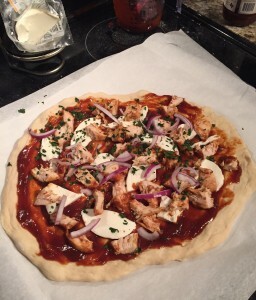 For Week 8, I wanted to make a BBQ Chicken Pizza. Josh really likes that kind of pizza, and I was ready to try something other than my standard ham and pineapple. I figured this recipe from Honest & Tasty would be worth trying. I found it on Pinterest awhile ago, and decided to finally put it to use. Because I like to take the easy way out, I didn’t make the homemade dough that she did – but she has a fairly simple recipe if you’d like to try it out. I opted to buy some pre-made dough at Publix, that it tried and true in our house. Love their stuff! I started on the chicken first, baking it covered in Stubb’s Sticky Sweet BBQ sauce. It was our first time using Stubb’s, but it won’t be the last. 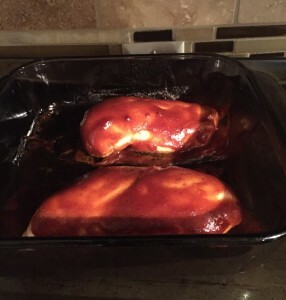 I baked the two chicken breasts for around 20-22 min, and pulled them out. They looked good! While the chicken was baking, I pulled out our cast iron pizza stone that I purchased on Amazon awhile back. We’ve used it many times, but I feel like every time it has been used, we’ve had a different outcome (all good, just different). I originally was going to follow the steps we normally take to pre-head the dough, but decided to try something new after I floured the stone… After reading a few things online, I wanted to bake our pizza at 550F, instead of 400F. So once the chicken finished, I went ahead and put the pizza stone in the oven and set the temp to 550F to let the stone start getting hot, because I didn’t preheat it while the chicken was baking. While the stone was heating up, I took some parchment paper and laid out the dough. 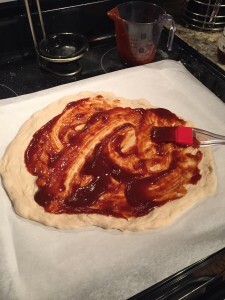 Once it was spread out, I smeared some more of the Stubb’s BBQ on the dough. 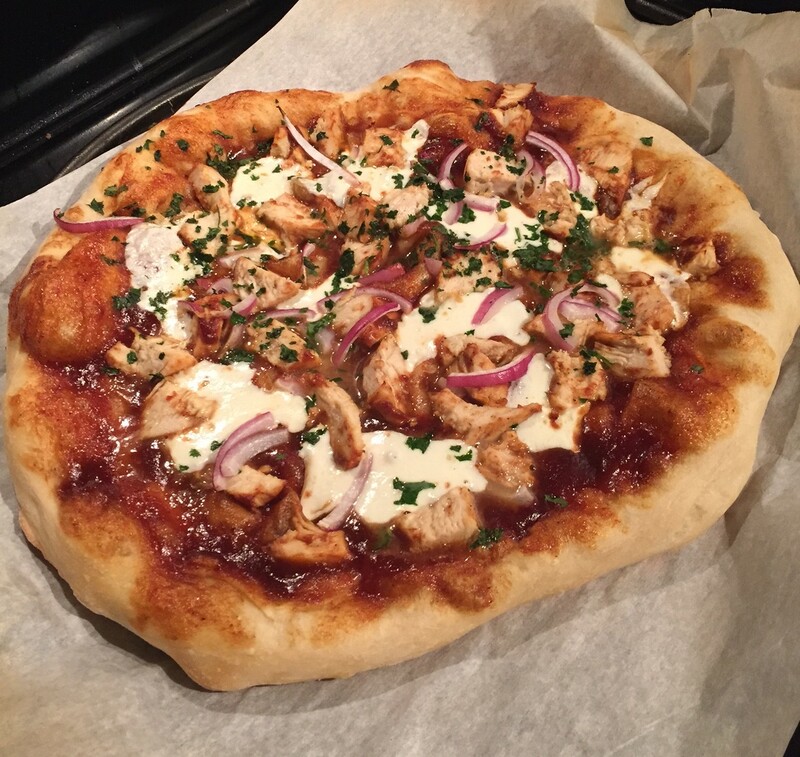 After letting the chicken rest, I cut that up and placed it on the pizza dough, along with fresh mozzarella, red onions, and cilantro. When the oven indicated it hit my desired temp, I carefully opened the oven and slid the parchment paper onto the pizza stone. The parchment paper I had indicated it could be baked up to 400-something degrees, but everything I read online indicated it’d be safe for a short period of time at a higher temp. I baked the pizza for 10 minutes at 550F, while keeping a close eye on the parchment paper. The aroma in the kitchen was delightful. I couldn’t wait to take our pizza out of the oven! Guys, this is probably the most perfect pizza that’s ever come out of our oven. The crust was SPOT. ON. I will forever more bake pizza crust at 550F, unless it’s the dead of summer…then we may just order out. The kitchen got a bit warm, but it was totally worth it. We will *absolutely* make this again. Amy – 5 out of 5 stars. So. Freaking. Good. I am not a huge BBQ Chicken pizza fan, but this was really, really, really good. Josh – 5 out of 5 stars. Perfect score from Josh! Really, it should be the second perfect score…but taking away for the smoke during the scallops event kept me from a perfect score. 😉 Happy husband with this recipe, and he definitely interested in having this recipe again in the future. Thanks for stopping by! We are definitely big fans of this one. 🙂 The testing of recipes has been a fun challenge, and great to give me new ideas for things to plan for dinner during the week. I just got tired of making the same things over and over again!